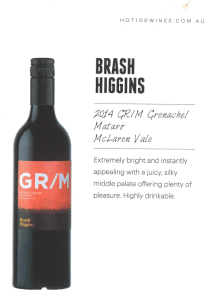 The 2014 Brash Higgins ‘GR/M’ Grenache/Mataro Co-ferment was picked last week as one of South Australia’s most drinkable wines in the 2015/2016 season. The Adelaide Review Hot 100 event is a yearly wine show based in Adelaide that’s purpose is to find and celebrate the most drinkable wines in South Australia. Thousands of wines from all over South Australia are entered. Go here for the full results and here for more info about this totally unique, annual wine event.